We run regular classes and workshops in Taichi (Tàijíquán) across the UK as a system of exercise and personal development, and as a martial art. The UK branch of the Tàijíquán School of Central Equilibrium (TSCE-UK) has been established since 1997, when Wee Kee Jin first visited the UK to run workshops at the invitation of Peter Dobson. This website serves as a hub for public awareness, student information and the advertising of TSCE classes and workshops. TSCE-UK is not an 'organisation' in the strict sense of the word. Organisational politics divert attention from practice and we prefer that clubs, classes and workshops are run autonomously by the instructors. 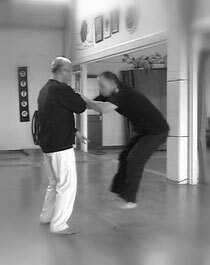 There are no offices, ranks or positions, and TSCE-UK is simply a collective name for those in the UK who are practicing the methods of Tàijíquán and Baihequán taught by Wee Kee Jin. If you wish to be kept up to date with workshops run either by Wee Kee Jin, or by TSCE-UK Instructors, it is a good idea to join our rmailing list.